ATLANTA, May 4, 2011—For the second consecutive year, LittlePINKBook.com announces its Spring Into Ownership Event Series, celebrating women business owners and their entrepreneurial spirit. This year, Spring Into Ownership has expanded to three cities, featuring prominent and diverse women owners on lunch panels in Atlanta on June 13 (where there will also be breakout sessions), Los Angeles on June 2 and New York City on June 17. Hundreds of career women attend these events to network and hear success secrets from women owners on topics like growing their business in this unpredictable economic climate, creatively breaking through the more traditional structures and processes currently in place and finding courage to do what they love. This year’s sponsors and supporters include Porsche, ServCorp, Smirnoff Premium Mixed Malt Drinks, FedEx, Jackson Lewis and Microsoft. “We are proud to join forces with Little PINK Book to celebrate women in business,” says Servcorp’s VP/General Manager USA Jennifer Goodwyn. Majority woman-owned firms now account for 29 percent of all enterprises. The number of these firms grew by 50 percent between 1997 and 2011, compared to a 25 percent increase in male owned firms. However, fewer than 2 percent of woman-owned firms hit $1M in annual revenue. •	Karen Trilevsky, founder and CEO, FullBloom Baking Co.
•	Celeste Gudas, founder and CEO, 24 Seven Inc. PINK has raised more than $70,000 for nonprofits through events. Proceeds from this year’s event will benefit the Global Medical Relief Fund. For media inquiries, contact Danielle Jackson at info@pinkmagazine.com or 404-240-2524. 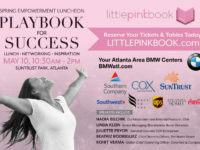 For details & sign up, visit littlepinkbook.com. PINK has been called “ the No. 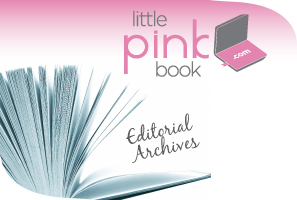 1 online resource for America’s working women.” PINK is the only global online community, daily e-Note (free and delivered right to your inbox daily, with over one million e-Notes going out each month) and national event series exclusively for professional women.